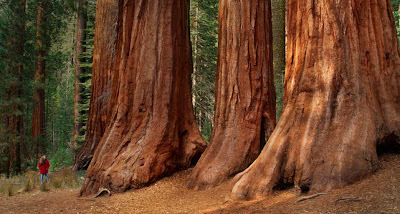 How does a giant sequoia, Sequoiadendron sempervirens, spread its seeds? It’s not as simple as you might think. Seed dispersal takes a number of forms involving two different mutualistic relationships. a. The first, and most obvious, way is when the seed bearing cones dry and release the seeds, which are carried far from the parent tree by small, oval shaped wings. This method is reliable, and wide dispersal will help prevent saplings from having to compete with its parent for nutrients and light, which is especially important as giant sequoias are very shade-intolerant. They grow tall very quickly in their early years and consume a large number of nutrients in doing so. b. Seeds fall in a constant storm during the summer and fall months, but most of the cones from which these seeds fell did not brown from age. The cones have dried with the help of a special friend, Phymatodes nitidus. This long horned wood boring beetle lays its eggs where the cone and scale meet. When the larvae hatch, they eat the flesh of the cone scales. Each cone scale has two layers of veins, which are often severed when the larvae eat their meal. Water can no longer reach the cone scales, so they dry up and release the seeds that they were holding in place. This is a perfect example of a mutualistic relationship, a special kind of symbiosis that benefits both partners in the relationship. The beetle larvae get a delicious food source, while the Sequoia tree gets help spreading its seeds before its cones get so old that the seeds lose viability, or before so many lichens grow on the cones and prevent the seeds from escaping. c. The other coevolutionary relationship that sequoias use to disperse seeds is with the Douglas squirrel, Tamiasciurus douglasii, also known as the chickaree. The Douglas squirrel prefers to eat the seeds of pines, firs, and incense cedars when available, but in Sequoia groves these trees may be absent. In such groves the squirrel will consume the flesh from the scales of green sequoia cones, eating the part that is roughly equivalent to part of the artichoke humans eat. Sequoia seeds are tiny, too small to provide much nutrition, so they are not a significant part of the squirrel’s feed, but they are dislodged during the cone consumption process, through which they drift to the ground. d. In addition to the cones that Douglas squirrels consume directly off the branch, the squirrels will store, or cache, cones for future consumption. 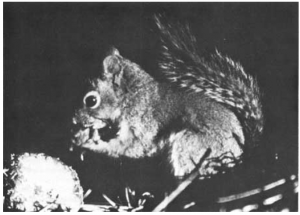 Douglas squirrels may bury only six or seven cones in the leaf litter or duff, where space is limited, but along streams or in other moist soil their caches can reach thousands. Douglas squirrels often displace the western gray squirrel in red fir forests above the snow line because they make such large caches, which pay off the energy expenditure to dig them up. Western gray squirrels, on the other hand, use small caches, which are too energetically expensive to dig out of the snow for survival. When the squirrel returns to eat its cones, the seeds spill on the ground, and, after a winter of storage in the cold ground, can propagate in the spring. The cones the Douglas squirrels forget about will also eventually dry and disperse their seeds. e. Finally, for reasons unknown, Douglas squirrels cut hundreds of cones off of the trees from which they feed. One squirrel was actually observed cutting 539 cones off of a sequoia in 31 minutes! Another team watched a single Douglas squirrel cut approximately 12,000 cones from sequoias in a single day. While the reason for this behavior may not yet be understood, it certainly contributes to the sequoia’s reproductive success and to the future food supply of the squirrel. Fire also plays an important role in seed propagation, as it clears open patches that would otherwise be filled by fire susceptible species such as fir, so that young sequoias can access light, it frees nutrients from older trees for use in new growth, and it reduces competition for water, light, and nutrients. Many sequoias can be seen growing in a row, where they likely propagated under a burnt log that provided a nutrient rich ash bed within which the seeds could grow. Fire does help more cones to dry and release their seeds, but it is not required for seeds to become viable as it is for some tree species. Hartesveldt, R., Harvey, H. T., Shellhammer, H. S., & Stecker, R. E. (1975, January 1). The Giant Sequoia of the Sierra Nevada. . Retrieved July 25, 2014. National Park Service. (2014, July 25). Fire’s Role in a Sequoia Forest. National Parks Service. Retrieved July 26, 2014. This entry was posted in Southern California Mountains and tagged coevolution, giant sequoia, mutualism, symbiosis, symbiotic relationships. Bookmark the permalink.